This cozy log cabin in Lake Lure, North Carolina, embraces you from the moment you enter - any time of year. Whether it's morning coffee on the porch, watching the sunset over the mountains from the deck, enjoying the beach on a sunny summer day at Mirror Lake or Lake Lure, or cuddling in front of the fire on a winter's eve, you are encouraged to catch your breath and relax in a tranquil, natural setting in the foothills of the beautiful Blue Ridge Mountains. Perhaps the window seat or the hammock will encourage you to indulge in a good book or a well-deserved nap. Enjoy lunch on either screened porch. We are pet friendly! NOTE: Please read the descriptions under each of the photos. This cabin is not on the lake. November to middle of May: minimum rental is 3 nights. 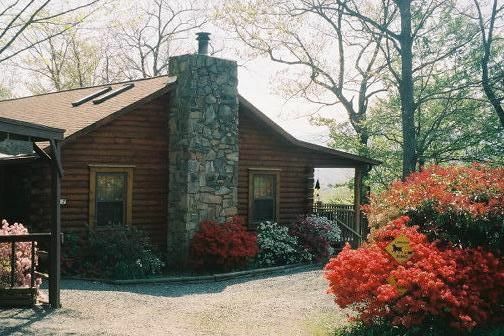 Springtime brings the cabin's great show of azaleas and dogwoods in bloom. From the deck during the summer watch the hummingbirds and bluebirds by day and the fireflies in the evening. The variety of trees provides a colorful, wondrous autumn. Winter mountain views are majestic. Lovingly furnished with an eclectic mix of antiques and rustic pieces, the great room has a fireplace, cathedral ceiling, skylights, and ceiling fans. TV, VCR, DVD player, a large collection of movies, satellite TV, WiFi, and board games provide many choices for entertainment. Sleeping accommodations offer two bedrooms (one king; one queen), and a futon in the great room converts to a double bed. Two full baths (linens provided). Ceiling fan in each room. Central heat and air. WiFi included - convenient for checking out local attractions and keeping in touch. Kitchen is fully equipped including refrigerator/freezer, stove/oven, dishwasher, microwave, toaster over, coffee maker, crock pot, blender, pots and pans, utensils, and dishes. Favorite spots are the deck and the two screened porches. A hammock chair, cedar porch swing, gas grill, and patio furniture are provided for your enjoyment. The double hammock under the trees is a great spot to read. Located in Riverbend, a gated community, guests have use of its amenities just a 5 minute drive from the cabin. - 'Old Swimming Hole' on the river - good place for the dogs to swim. Lots of unique restaurants within a 5 to 20 minute drive. Well behaved dogs and cats are welcome! For dogs, the deck is enclosed with a railing and connects to a fenced-in yard. Cats will likely enjoy the screened in porches. No smoking at all, please. To start a reservation, click on 'BOOK IT' on right. Click 'EMAIL OWNER' or 'SHOW PHONE NUMBER' on right. Happy to chat with you! The pups and I enjoy walks and play time, both at the cabin and at home. Hard to tell which of us gets more enjoyment our of our daily morning walks. The cabin is a labor of love, and it's fulfilling to share it with guests. I take great pride in providing a welcoming and comfortable retreat for you. Although only a two hour drive from Kernersville, NC, the Lake Lure area is a world away from the city. The scenic vistas inspire and soothe the soul. There's something very special about hanging out at the cabin - whether on a porch or on the swing. Peaceful and welcoming. The cabin is in a private setting on over a wooded acre on a gated road, yet it is convenient to a large grocery store, restaurants, and the area attractions. Being in a gated community, guests have access to a private lake with swimming beach and a scenic picnic area along the river. The town of Lake Lure with a large town beach is a 15 min. scenic drive away. Winter view to the west of the picturesque mountains in the area. Summer offers glimpses. Charming towns of Lake Lure and Chimney Rock 15 min. drive. Many unique restaurants, shops, and activities. River walk, lake shore park, fishing, boat rentals, mini golf, coffee shops, antiquing. Mirror Lake is a private lake within Riverbend, the gated community where the cabin is located. Has a nice picnic pavilion. Lake Lure itself offers boating, fishing, and narrated boat tour. The Rocky Broad River is what forms Lake Lure. Scenic river walk in Chimney Rock. It flows through the gated community of Riverbend where the cabin is located. Scenic picnic area on the riverbank. Sheets, blankets, quilts, pillows, towels provided. fully equipped kitchen - refrigerator, freezer, stove, oven, dishwasher, microwave, toaster oven, mixer, blender, crock pot. Access to Riverbend amentities (private lake with beach, picnic area, river access), central heat & air, ceiling fans, skylights, screened in porch, selection of movies, board games, books, CD players, porch swing, hammock chair, Heated mattress pads (winter), No Smoking please, Well behaved pets welcome. Zip line outfit 5 min. drive, Antique and Craft Shopping, Boat Tours, Area attractions, Lake Lure, Chimney Rock, Black Mountain, Biltmore Estate, 3 golf courses within 10 min. drive. Good birdwatching area.